The Runelords were powerful wizard-kings who ruled over ancient Thassilon after the demise of King Xin. Some or all of them may have found means to survive the cataclysm of Earthfall. The Pathfinder Society is an organization of explorers (or trouble-makers) and archaeologists (or grave-robbers). Several of the group’s most prominent members have parted ways with the organization after conflicts with its secretive inner circle known as the Decemvirate. Dan Scott pits the boys against the Sczarni werewolves. While I’ve written before about earliest Radovan & the Count stories, I recall more anecdotes every time I “research” for the latest. For the struggle of finding the right voices and style for the novel—as well as influences from Universal Horror movies and other places—see that earlier post. Today I’d like to remember why I chose the setting of Ustalav and some of the supporting cast. Mild to moderate spoilers follow. I left the end of “Hell’s Pawns” a little ambiguous for a reason. Editor James Sutter had already encouraged me to use one or both of the boys in a novel pitch, but at that time he suggested a Radovan solo novel would be fine by him. I considered it, perhaps a story following Radovan to Varisia and the cities of Riddleport, Magnimar, and Korvosa. That might have been a darker tale involving more of a traditional criminal element, and it might have seen Radovan adopting more of Varian’s detective skills. I probably would have needed to give Radovan a sidekick or a femme fatale to give him someone to talk with, but I don’t recall developing the idea beyond a thumbnail. I’m pretty sure I pitched a couple of different ideas, but the one James and I both liked best was a trip to Ustalav.What I loved about that “mist-shrouded principality” were several things: with a name like Radovan, my hellspawn’s human bloodline logically sprung from such a place; I love gothic faux-Eastern Europe; and, perhaps best of all, Ustlav had six pages of description in the campaign guide. Much as I loved Varisia, by that time there were three Adventure Paths and loads of Pathfinder Chronicles set there, not to mention modules and other source material. The earliest Pathfinder Tales novels had very short deadlines, so it seemed a mistake to tackle a region that required a lot of research. On the other hand, having names for locations and prominent characters gave me a foundation in Golarion while leaving huge swathes of “undiscovered country” to flesh out. Almost all of my invention, apart from the story and much of the supporting cast, was in small details. Drawing the Wings of Desna or the Spiral of Pharasma over one’s heart, for instance, added a couple of gestures to Radovan’s infamous Tines. The water ritual at the Cathedral in Caliphas seemed like a logical expression of the church’s beliefs. Riffle scrolls and the inclusion of a monster from a different culture seemed like good ways to take something that already existed in Golarion and present it in a fresh, surprising way. (In the case of riffle scrolls, it also allowed me to develop Varian’s affliction without yet answering the questions it raised—for those answers, you’ll want to read Lord of Runes.) Little stuff like that is a fun way to contribute to the setting, and it’s much less likely to get nixed than killing a prominent character or setting countries to war. As for the particular clan of Sczarni who show up in Prince of Wolves, I wanted a group with which Radovan could feel some affinity but who were even more brutal and dangerous than he.It was also fun to set him against other characters with a duel nature. Also, using the Sczarni gave me the chance to indulge in lots of the stereotypical trappings of the wandering people of horror films while adding a few twists to make them unique to Golarion. The “witch” Azra is one of my favorite characters, so much so that my first suggestion for a second Pathfinder Tales novel would have starred her and Azra. That didn’t fly at the time because some at Paizo were concerned that a mute character would make a poor POV character. (I felt exactly the opposite.) Since then, that feeling might have softened, but after a second novel with the boys, we all felt it better to continue with them rather than to switch characters. Incidentally, the oracle class didn’t exist in the Pathfinder Roleplaying Game when Azra first appeared, but it sure does seem to suit her. I love how the expanding rules of the game, combined with the imagination of the players, alter the game versions of the characters over time. I try to have all the characters generally fit the rules without being strictly bound to them. You never want “to hear the dice rolling,” as it were, but you do want the “physics” in the fiction to jibe with the game rules so that readers and gamers feel like the game and the fiction are in the same world. 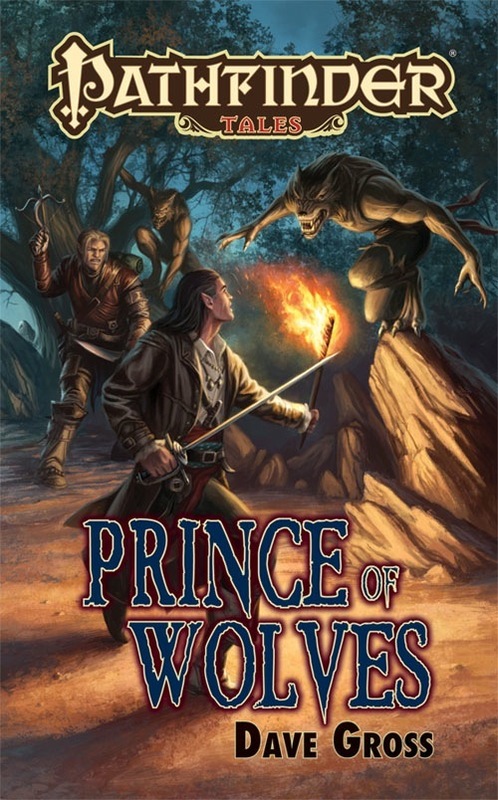 One last note: Wes Schneider cemented my already considerable affection for him when, while organizing the Carrion Crown Adventure Path, he sent each of the freelance designers a copy of Prince of Wolves with the request to include some element of it in their design, if possible. Seeing tiny echoes of my novel in that AP was almost as delightful as seeing Reaper’s Varian Jeggare miniature at Gen Con 2010. Every time I write about one of the previous Pathfinder Tales books, I ramble on for much longer than I thought I could. I’ll stop then, leaving myself a few stories to tell at conventions this summer. Will I see you there? Kaer Maga is an ancient city on the very edge of the Storval Plateau in Varisia. Home to a bewildering diversity of humanoid beings, it also houses ancient knowledge and evil secrets. Check out the Pathfinder Tales Book club, a small but growing group of readers who’d welcome more voices as they discuss the novels. Lately they’ve covered Crusader Road, Death’s Heretic, and The Redemption Engine. They’re a clever lot with diverse tastes, so it makes for lively reading. The more the merrier and, especially if you haven’t been on the Paizo boards before, I encourage you to register and get involved. It’s free, and you can easily opt out of the mailings. Eric Belisle’s Count Jeggare altered and solidified my image of the character. 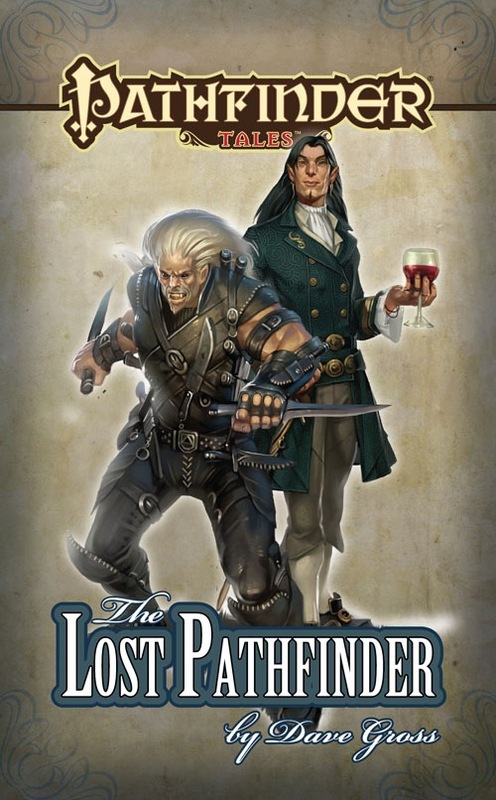 In June 2010, “The Lost Pathfinder” (still free, but also available in handy ePub format for a buck) launched the Pathfinder Tales web fiction. Since 2010, a new chapter has gone up on the Web Fiction page almost every week. As I compose this post, there are well over fifty stories available, all set in the world of Golarion but all different in style, tone, structure, and even genre. If you find a story that doesn’t work for you, skip to the next one, and it probably will. You’ll find work from Elaine Cunningham, Kevin Andrew Murphy, Amber E. Scott, Liane Merciel, Robin D. Laws, Wendy Wagner, Monte Cook, Tim Pratt, and many others, including setting-creators, developers, and editors Erik Mona, F. Wesley Schneider, Christopher Paul Carey, and James L. Sutter. Some of these stories were basically the proving ground for later novels, and others are introductions to those novels. I strongly encourage you to check it out. There are some real gems in there. But enough about them and more about me and the boys. While it was the second Radovan & the Count story published, “The Lost Pathfinder” was actually the third written after I knocked out Prince of Wolves in an exhilaratingly short time. Fun fact: “The Lost Pathfinder” was one of the early title ideas for the novel, but because it would look goofy to have the word “Pathfinder” in both the title and the logo, James had me pitch alternatives. I’m glad he did, because the whole “[RANK] of [DANGEROUS THING]” structure began there, and that has been a useful means to emphasize my pulp adventure intentions while giving the boys a “series within a series” framework. My big fear when writing this story, partly borne out in reader reaction, is that it’s a pretty jerky introduction to Varian. Radovan is more or less himself during the events of “The Lost Pathfinder,” but Varian is at a low, and he doesn’t come across as a very sympathetic guy. The reason for that is that I wanted to give him plenty of room to grow into a sympathetic character in Prince of Wolves. In retrospect I realize it makes it harder for readers to latch onto him as a sympathetic protagonist, so I seldom recommend “The Lost Pathfinder” as a starting point. Even though the boys alternate points-of-view in “The Lost Pathfinder,” it’s mostly Radovan’s story, since he’s the one with an external conflict and more interaction with other characters. While I’d already established an ongoing gag with his jacket in Prince of Wolves, I wanted to make a strong nod to it here, a moment that gave me hope when editor James Sutter noted he laughed while reading the manuscript. Unlike the novels, in which I indulge my love of gothic horror, kung fu movies, classic fellowship fantasy, or platoon-level war stories, “The Lost Pathfinder” is not modeled on another beloved genre. It’s an “Egorian” story. Another fun fact: When I first saw Eric Belisle’s gorgeous artwork, it galvanized my mental image of Count Jeggare. While the illustration of Radovan is excellent, and both served as reference for the now-scarce Reaper miniatures of the characters, I still haven’t seen the Radovan the way Eric captured the image of the Count. That said, there are some excellent illustrations of both characters on future covers and web fiction, not to mention a couple of game publications. Go take a peek at “The Lost Pathfinder” and let me know what you think of it here, at Paizo, or at Goodreads. First newsletter coming soon. Join now to get in on the latest news and giveaways.